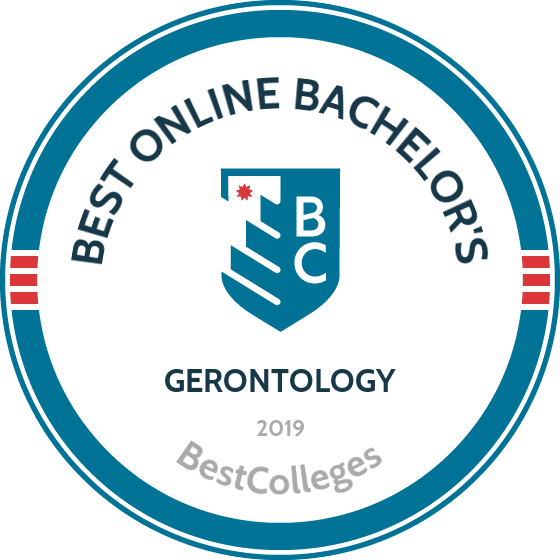 What are the Best Online Bachelor's in Gerontology Programs? What Else can I Expect from an Online Bachelor's in Gerontology Program? As the baby boomer generation ages, jobs in human and health services are growing exponentially. Earning a bachelor's in gerontology is a great way to begin a fulfilling career in this rapidly expanding industry. The Bureau of Labor Statistics projects jobs in the field to increase by 11% in next few years alone, which is just one reason interest in gerontology undergraduate degrees is growing. There are many great options for online gerontology bachelor degree programs. This guide will introduce some of these options and help you understand the important factors that go into choosing the best program for you. Gerontology, put simply, is the study of aging. More specifically, gerontology covers the physical, emotional, and social changes that aging people face as well as the aging population's effect on society. Prospective gerontology students can choose between bachelor's of arts, bachelor's of multidisciplinary studies (BMS), or bachelor's of science degrees. The specific type of program you choose will determine course requirements, projects, and topics covered. For example, a BMS degree in gerontology has a relatively broad focus, with opportunities for students to study in a variety of related fields, including social work, public health, or psychology. A BS degree emphasizes scientific areas of gerontology, such as biology or physiology. However, there are a several topics that the program will cover regardless of the specific degree type you choose. These topics include the fundamental principles of gerontology, programs and services for the elderly, public policy regarding elderly care, and adult development. Brandman University started as a school delivering education at a Marine Corps air station in California. Today, the university offers online or hybrid courses, including a bachelor of arts in psychology with a gerontology concentration. Online courses give students the flexibility to study and do classwork as their schedules permit. Hybrid courses take place online and at one of Brandman's 25 locations in California and Washington. The degree requires 120 credits for graduation. Students take core courses with an emphasis on psychology, including abnormal and social psychology, and a psychology capstone project. Statistics, critical thinking, behavioral science, and human development courses round out the core classwork. In the gerontology concentration, which contains 15 credits, students examine the physiological and psychosocial issues of aging from a social and health perspective. Learners discuss bereavement, social policy, and culture during the concentration. Armed with an online gerontology bachelor degree, students understand behavioral science methodology, statistical techniques, and the needs of the elderly. Graduates prepare themselves for careers in counseling, assisted living, healthcare, elder planning, and adult protective services. Applicants seeking an online gerontology bachelor degree must have a minimum of 12 bachelor-level transfer credits from another accredited university. Candidates without those credits may take pre-admission courses at Brandman. To qualify for the online gerontology degree, students transcripts must show a minimum 2.0 GPA. Brandman holds accreditation from the WASC Senior College and University Commission. In 1869, the University of Nebraska opened in Lincoln, the state capital. Now, it's the state's only public university, offering four campus sites and more than 100 online degrees, including the bachelor of multidisciplinary studies in gerontology. The online, 120-credit course focuses on biological, behavioral, and social changes associated with aging. The gerontology degree online prepares students to help people face the challenges of aging. Core courses introduce students to concepts in gerontology using an asynchronous learning format. Classwork examines community resources and changes related to aging. Electives cover death and dying, long-term care, housing issues, and how baby boomers impact businesses. A practicum gives students the opportunity to share their experiences as they develop their perspectives on aging. The program partners with the Department of Gerontology, whose research includes planning at the end of life, care-giving, and public policy. Graduates who earn a gerontology degree online prepare themselves for a range of careers. Students find positions as caregivers, geriatric case managers, estate or financial planners, and administrators in assisted living facilities. Candidates with a high school diploma or GED who took the ACT or SAT may apply for the online gerontology bachelor degree. The university offers students a review process for transfer credits. The Higher Learning Commission provides accreditation to the University of Nebraska. Southern New Hampshire University (SNHU) started its flexible learning format in 1932, offering day and evening classes to students training as bookkeepers, secretaries, and junior accountants. From that small, two-room facility, SNHU has grown to offer more than 200 online degree programs, including the bachelor of arts in human services with a gerontology focus. This online bachelor's degree in gerontology focuses on a range of issues facing the elderly, including wellness, disease, long-term care, and psychosocial topics related to aging. The degree appeals to students interested in helping the elderly through late-life challenges. The concentration requires four courses and 12 credits in aging perspectives, aging and wellness, epidemiology, politics, and policy. The general degree requires 120 credits and dovetails with the human services program, which seeks to help people navigate social systems. With a concentration in gerontology, students can look forward to careers in public health, hospitals, nursing homes, and agencies that assist the aging population. SNHU streamlines its application process for the gerontology degree online. Candidates fill out the application form, noting high school graduation or GED completion. Applicants with college experience must complete a transfer release form. The university does not charge an application fee for transferring undergraduates and allows up to 90 transfer credits. The New England Commission on Higher Education provides accreditation to SNHU. Originally founded on its 70-acre campus in Virginia Beach, Virginia in 1977, Regent University offers more than 130 programs with a Christian perspective, including a bachelor of science in gerontology. This online gerontology bachelor's degree focuses on leadership skills needed to work in organizations that support seniors. The program mixes biophysical sciences, healthcare management, and psychology, and prepares students to create programs that serve seniors. Coursework examines physical and emotional changes in the elderly, aging and retirement theories and models, and the impact aging has on families and caregivers, including social issues pertaining to poverty, abuse, death, and dying. Classes also study the racial and gender differences in aging, biblical views on aging, and spiritual foundations for caring for the elderly. Students need 120 credits to complete the degree, with each class lasting eight weeks. Regent's liberal transfer policy means students can transfer up to 90 credits. Graduates can find jobs as administrative gerontologists, social workers, and entry-level social scientists, or enter master's programs as research gerontologists. The application process requires an unofficial transcript, an applicant questionnaire, and a government-issued ID. Regent holds accreditation from the Southern Association of Colleges and Schools Commission on Colleges. Back in 1950, the Primitive Baptist Church chartered a two-year college in Thomasville, Georgia, not far from the Florida border. Over the years, the school grew to become a nonsectarian and independent four-year institution, renamed Thomas University, which now offers 43 degree programs. As part of its vision and mission to prepare students for a complex, ever-changing society, the university offers an online bachelor of science in rehabilitation studies with a concentration in gerontology. Students explore trends affecting aging populations across a spectrum of topics, examining the social, economic, and health issues faced by the elderly. Coursework also tackles the cultural, ethical, and economic challenges of working with the elderly. All classes are administered online. This gerontology concentration prepares graduates for careers working with older adults. Armed with an online gerontology bachelor degree, students qualify for jobs in a variety of sectors, including in healthcare facilities, hospitals, eldercare groups, and public and private agencies. Applicants must include transcripts demonstrating a minimum 2.0 high school GPA or a completed GED. Students who surpass SAT or ACT scoring minimums do not need to take placement tests. The university may accept transfer students with a GPA below the required minimum on a provisional basis, and students must maintain a 2.0 GPA while in school. Thomas University is accredited by the Southern Association of Colleges and Schools Commission on Colleges. As mentioned earlier in this guide, gerontology bachelor degree programs can vary greatly depending on a variety of factors. Whether the program is housed under an arts, multidisciplinary, or science degree is one of these contributing factors, but programs and their requirements also vary from school to school. Depending on the school and program you choose, your bachelor's in gerontology may require different coursework and even cover different topics. Below are a few examples of courses you might encounter while earning your degree. Studies in Aging: As gerontology is the technical term for the study of aging, this is a foundational course you will take regardless of which program you choose. This course introduces issues and theories in aging from both scientific and social perspectives. It also examines how aging affects families, communities, and society as a whole. Lifespan Development: Also sometimes called adult development, this course teaches gerontology students about the changes that happen over the course of the human lifespan, including physical, social, and emotional shifts. This course also covers how culture and community contribute to different developmental processes. Human Services: Many gerontology bachelor degree programs include courses in human services, as many students studying gerontology will go on to work in this field. The goal of these courses is to provide an understanding of the role human services plays in the lives of aging adults, and the different services these organizations provide. HOW LONG DOES IT TAKE TO GET AN ONLINE BACHELOR'S IN GERONTOLOGY? Generally speaking, undergraduate degrees can take between two and four years to complete, but this amount of time can vary greatly from program to program and student to student. There are a handful of factors that affect program duration. Students in traditional on-campus programs are more likely to enroll full time, and often can dedicate more time to their school work. Meanwhile, students who are enrolled part-time often require more time to complete their degree. Some schools and programs offer accelerated options or shorter terms than full-length academic semesters. Others offer the option to "test out" of certain degree requirements if the student can prove their competence in that specific area. Certain programs have students enter in cohorts, groups of students who begin programs together and progress through the entire program with that same group of peers, while other programs allow students to progress at an individualized pace. More than likely, you've heard the term "accreditation" before, but what exactly does it mean? Accreditation is essentially the way schools and individual programs are held to specific standards of education by accrediting agencies. Accreditation is very important when it comes to selecting a reputable school or program. Unaccredited schools or programs are often non-reciprocal, meaning that degrees and credits earned from these institutions and programs are often not recognized by other institutions and employers. A school might be accredited regionally or nationally, but regional accreditation is generally the more popular of the two. Regional accrediting agencies are widely recognized and degrees and credits from regionally accredited schools are easily transferred to other institutions. In addition to regional accreditation, some majors also have field-specific accreditation. Gerontology, on its own, does not have its own specific accrediting body, but some gerontology programs may be accredited by broader agencies based in related fields, including public health or social work. The Department of Education and the Council for Higher Education Accreditation both offer comprehensive databases of all regionally and nationally accredited institutions. Choosing a school from one of these lists is important, as students enrolled in unaccredited schools are also ineligible to receive federal financial aid. Graduates with a bachelor's in gerontology work with older adults in retirement centers, public health administration, or even public policy. Below are a few potential careers for graduates of gerontology programs, and an overview of what these different careers entail. These professionals take on managerial roles within medical and health services, including retirement homes and elderly care facilities. These managers may run or supervise an entire facility, or may work in a specific department of a larger organization. They are often tasked with keeping up with changing laws and policies in healthcare, and making sure their facility meets these requirements. The main objective of these professionals is to connect clients with the community resources they need. Many pursue jobs in retirement homes, acting as a support system for the families of aging patients. The role often includes working closely with other professionals, such as social workers, to manage a specific patient's case. Social workers work with clients of all ages, including older adults. They manage the cases of clients dealing with difficult conditions, such as physical and mental disabilities, emotional issues, or addiction. Social workers help clients cope with these issues and improve their mental and physical states. These professionals work alongside licensed occupational therapists to help patients recover from (and cope with) injuries, illnesses, or disabilities. Older adults often require occupational and/or physical therapy to address physical changes as they age. Occupational therapy assistants work directly with therapists to administer occupational therapy while aides complete support duties. These educators work within communities to promote health and wellness. Community health workers and health educators often work with adults in retirement homes or elderly care facilities, developing and implementing wellness plans with the goal of improving health among community members. According to PayScale, location is the most important factor in determining your salary as a health and medical services worker, the primary career area for those with degrees in gerontology. Based on annual mean wage, the chart below maps the five top-paying states in this career field. Determining how to finance your bachelor's in gerontology can seem a bit daunting, but there are some ways you can make your degree more affordable. The first and most important step is to complete the Free Application for Student Aid (FAFSA) each year you are enrolled. The FAFSA connects you with any available federal funding, including grants and scholarships (which do not have to be paid back) and loans (which do). Students earning their bachelor's degree in gerontology may also consider looking within their communities for potential funding. For example, health services-based non-profit organizations may offer scholarships for qualified students.